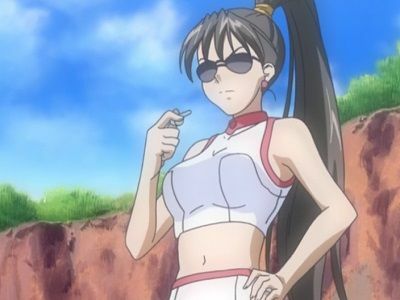 Akira takes Akari, Aika, and Alice for training with a customer and picks up a honeymoon couple for a morning-long gondola tour that ends up being a full-day chore. Akira purposely entraps the three trainees in a maze formed by the rising tide and several low-lying bridges. By working together, Akari and her friends eventually find a hidden way out, while the husband learns a lesson about patience and pride. When Alice graduates from middle school, she's happy that she can now spend more time practicing with Aika and Akari. Athena invites Alice on a picnic on a canal through the countryside outside Neo-Venezia, and has Alice treat her as a customer. Athena praises Alice's skills as an undine, and Alice responds that she is training with an excellent mentor. As they pass through a lock, Alice is startled when an undine wishes her good luck. While waiting for the lock to fill, Alice tells Athena that she's confident in all of her undine skills except singing canzone, and Athena tells her conveying a love for singing is more important than any technical skill. When they reach the Hill of Hope, the destination of the Single promotion exam, Akari, Aika, the owners of Orange Planet, and a representative from the Gondola Association are waiting for them. After an exam on canzone, Athena takes off both of Alice's gloves, promoting her straight from Pair to Prima (the first undine ever to do so), and gives her the title Orange Princess. Akari spends the night with Alice at Orange Company. 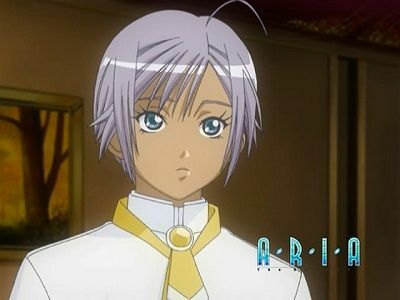 While there, Akari meets Athena, Alice's mentor and roommate, the third of the so-called Three Water Fairies. She also meets Alice's kitten, Maa-kun, who Alice keeps hidden from Athena because pets are forbidden in the company dorms. During the day, while Alice is at school, Maa-kun runs away but is finally found at dusk by Akari and Athena, who knew about the cat all along. After a day of practice, Akari, Aika, and Alice return to Aria Company and find their three mentors talking together. Alicia tells the trainees that they once did similar combined practice, but have seldom all met together since becoming primes (full undines). In flashbacks, Alicia and Akira as singles are shown befriending the extremely clumsy Athena and discovering her amazing talent as a singer. While escorting Aika and Alice home, Akari begins to cry when she realizes they three will also part ways one day. When Ai visits Akari for Neo-Venezia's Carnevale, she helps out at Aria Company. Before the festival starts, she sees President Aria leave by himself, and Akari tells her he'll be gone for the duration. On the first day of celebrations, Akari and Ai meet Casanova, the mysterious masked master of ceremonies of the Carnevale named after the historical figure. 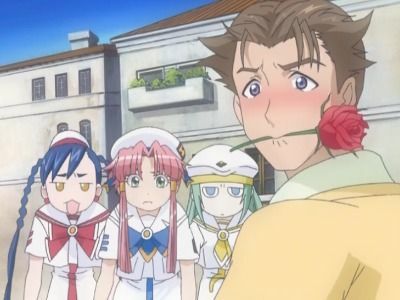 Later, on Ai's last day on Aqua, while talking with Aika and Alice they spot one of Casanova's attendants. They chase after him but Akari and Ai get separated from the others. Eventually they confront Casanova, who invites them to join his cheering procession for a while. 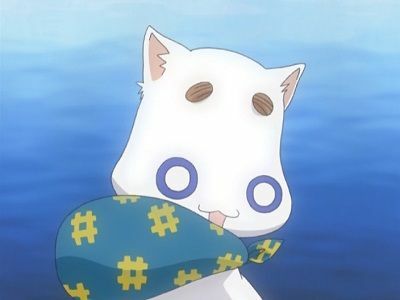 When he eventually stops them from following any further, he gives them each a jasmine flower before revealing that President Aria is one of his attendants, and that he is Cait Sith, the legendary king of Aqua's cats. 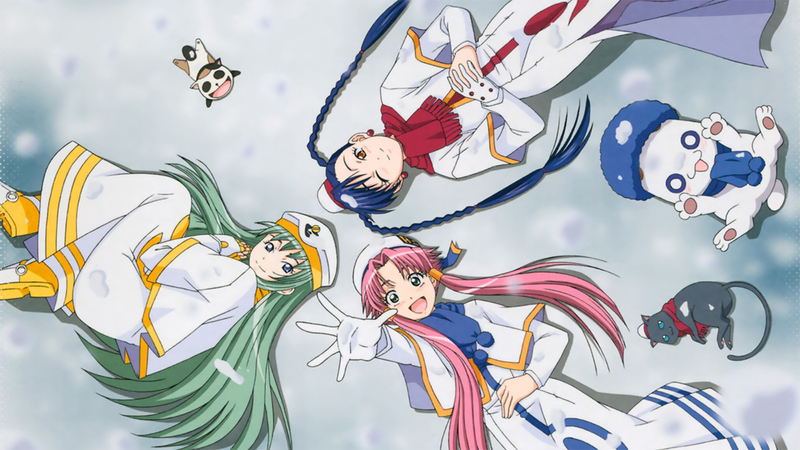 When Aika and Alice finally find Akari and Ai, they claim that Casanova is a fairy. When Akari learns there will be a meteor shower that night, she, Aika, and Alice make plans to watch it. As they do so, they meet Al, a gnome (an underground regulator of Aqua's gravity) on a shopping trip to the planet's surface, who invites them to lunch. In return a blushing Aika invites him to join them that night. That evening, Alice bows out, leaving just Aika, Al, and Akari. Because Piazza San Marco is too crowded and bright, they search through the narrow streets for a better view. For courage through the darker passages, Akari repeats her chant from Casanova's procession. Eventually, Aika takes them onto the roof of a Himeya Company office building, with an unobstructed panorama of the night-time city and the meteors. 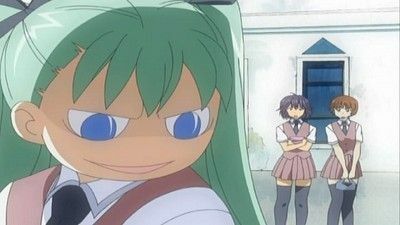 When Akari searches the rooftops for another vantage, Aika realizes she's alone with Al and gets flustered, and blames him as a gravity regulator for attracting all the meteors that burn up in the atmosphere. As they walk home, Al reminds Aika that some meteors don't burn up but survive to reach the surface. Mr. Mailman borrows Akari and her gondola for a day so he can complete his rounds while his gondola is repaired. In the morning, they collect mail from canal-side postboxes, then after lunch deliver the mail—and along the way help a boy deliver in person a letter to his former teacher at her wedding, apologizing for behaving badly to her because he was upset over her leaving. At the end of the day, Mr. Mailman explains that Neo-Venezians prefer the inconvience of mail because a letter, being not as quickly written as e-mail, can carry the sender's heart, and so can become a treasure, and furthermore it can be a link between the past and present. 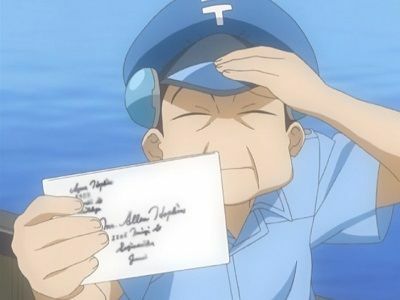 Akari says that letters are like Neo-Venezia, in that you can touch the creators' hearts through them, and Mr. Mailman tells her that she has been painted with "the color of Neo-Venezia". The next morning, Akari is moved when she receives his hand-written thank-you note. 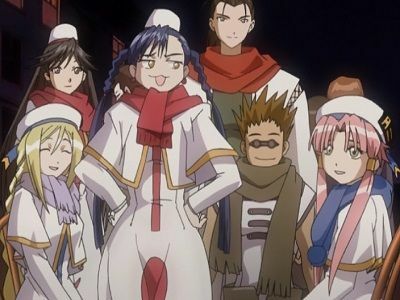 The next morning, Aika, Alice, and Akatsuki demand to know whether the news about Alicia is true, and Akari says yes, Alicia is retiring to get married and work for the Gondola Association. Alicia had delayed this until Akari became a Prima, and Akari blames herself for not becoming more reliable before now. Aika and Alice worry about Akari, but she says she'll be fine. The next several days are busy, as Alicia hands the running of Aria Company over to Akari. When Akari eventually breaks down crying, Alicia admits that Akari has long had the skills to be a Prima but she'd delayed the exam because she didn't want to leave Akari. Mr. Mailman, now retired himself, hires Akari for a tour, during which he offers to refer customers to her. At Alicia's retirement ceremony, all the undines of the city participate. The following morning, Akari sees Aria Company filled with memories of Alicia and her friends, then opens the reception-area shutter to let in her new beginning. In an afterword, Akari tells Ai what happens to the other characters—including Athena becoming an opera singer, leaving Akira the undisputed top Prima—ending with Ai's first morning as a new Pair for Aria Company. Akari receives a mysterious message, which directs her to a secluded bay where she meets Aika and Alice following similar messages. Together, they find Alicia and Akira, who sent the messages, and they spend the day in special training and relaxed swimming. During the annual flooding of Neo-Venezia, Akari is caught in a rain-shower away from home and shelters in her friend Aika's room at Himeya Company. Later, Aika gets in a fight with her strict mentor, Akira, and leaves to stay the night with Akari at Aria Company. 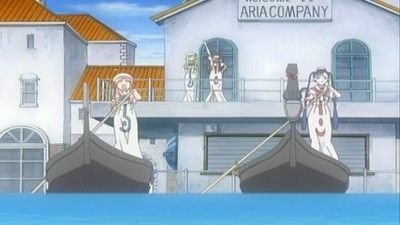 In a flashback, Aika remembers her first meeting with Akari's mentor, Alicia, showing why she admires Alicia and wants to become an undine (gondolier). During rowing practice on the first warm day of early spring, Aika, Akari, and Alice find a box in the base of a statue. Inside it is a note that sends them on a treasure hunt through the streets of Neo-Venezia. One clue leads them to Caffè Florian on Piazza San Marco that's the Venetian cafe (transported to Aqua) where cafe latte was supposedly invented, where Akari chats with a customer who calls himself an expert at enjoying the Piazza. After the shadow from the Campanile has moved far enough the three can find their next clue, he prays they discover a wonderful treasure. Their final clue leads them to a beautiful hillside view of Neo-Venezia, described as a "treasure in your heart". When they return the clues, so others can find this treasure for themselves, they notice marks indicating they are not the first to do so. 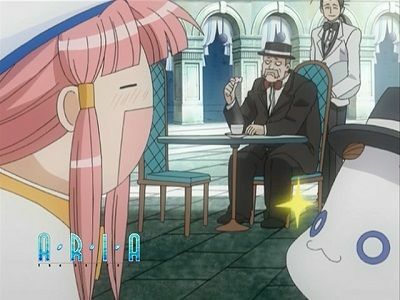 Back at the Piazza, Alicia introduces the man as the cafe's owner, and he greets Akari as an "Expert in Happiness." In response to Akari's e-mail about the day, Ai calls Neo-Venezia a big treasure chest. In the first half of a two-part episode, Alicia takes Akari to an island to visit a reproduction of a Japanese Inari shrine. When Akari buys some inari sushi, the saleswoman warns that if she meets any fox spirits, not to go with them. After getting separated from Alicia during a sunshower, Akari meets a wedding procession of fox spirits, and one holds out his hand to her. Frightened, she gives him her inari sushi, and they leave her. In the second half, Alicia takes Akari on a picnic to look for spring at a special place she knows on another island. After walking through a forest, they follow an old railway, but at a fork in the line they chose the wrong way. Just as they are about to turn back, they find an abandoned rail-car beneath a large blooming cherry tree. While they admire it, Alicia tells a story about the importance of making mistakes in serendipity. 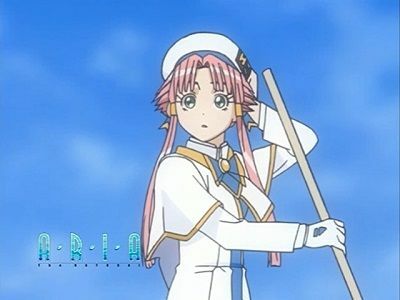 When Akari asks Alicia why Aria Company doesn't have a distinctive palina, or pole for hitching boats, Alicia doesn't know and suggests that Akari design one. Looking for inspiration, Akari searches the company archives and finds sketches for a palina design. Grandma Akino visits while in the city on business and tells her the sketch was made by one of her first employees, and was never executed because the company colors hadn't been decided. Akari comes up with a design in blue (for the sea and sky) and white, based on the old design and current company uniforms, and paints it herself. As they admire the new palina, Alicia says that one day, after she retires, Akari as a Prima will one day look at it with a junior employee of her own—at which time the palina will represent Akari as she is now. Akari replies that, no, Alicia is also part of the palina, and the original designer is as well. Ai writes that this means reading an old e-mail of theirs would let someone meet the two of them as they were at that time. Two weeks after Alice's promotion to Prima, Akira hears some Himeya Singles gossip about how Aika, the heir to the company, is handling "losing" to a competitor. Akira worries over whether Aika is holding up, but has difficulty talking about it with her until Aika mentions she was present at Alice's promotion. Aika assures Akira she's been motivated by the competition and asks to be trained hard. Akira sets the date for Aika's Prima exam in a month, and says she won't forgive her if she, as the company's future queen, fails. Meanwhile, Alice is settling into her working life as an undine, but has little free time. She realizes it's been several days since she last saw Akari and Aika, at the moon-gazing, but can think of no excuse to call her friends, even though she misses them and is lonely. When Akari and Aika pay a surprise visit with a pizza, Akari tells Alice that being a friend is reason enough. Akari tells Aika that practice has gotten lonely without Alice, and Aika apologizes that she can't practice either anymore: she's been promoted to Prima, with the title Rosen Queen, and will be managing a new Himeya Company branch office. When Akari tells Alicia, she wonders why Aika cried over this, and in response Alicia sets Akari's Prima exam for the next day. 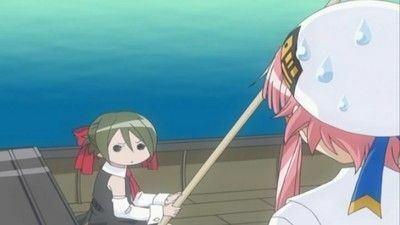 That night, Akari is too nervous to sleep and practices rowing until very late. In the morning it's raining, but Akari asks that the exam not be postponed, and by afternoon it has cleared enough to hold it. As Akari guides Alicia through the city, a number of friends greet her, and Akatsuki and Woody cheer her on from the Rialto Bridge. Alicia directs Akari down a very narrow, difficult channel, which she successfully negotiates, then gives Akari the choice of their final destination, which will determine what kind of Prima she'll be. 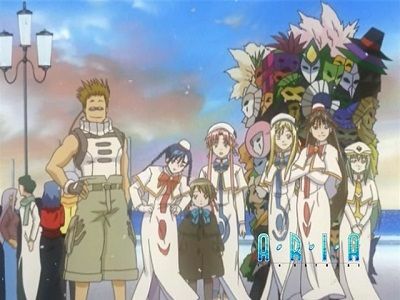 Akari takes her to Aria Company, where Alicia thanks Akari for coming into her life and takes off Akari's glove, promoting her to Prima with the title Aquamarine, then says she has something important to tell her. 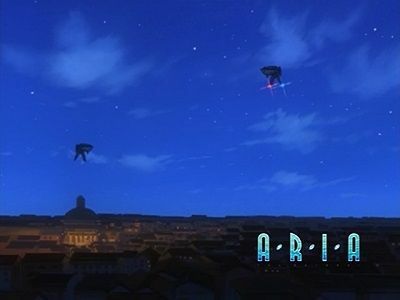 A young girl, Ai, arrives at Aria Company and demands that Akari give her a gondola tour of the city of Neo-Venezia. When Akari protests that, as a single (journeyman), she is not allowed to guide customers without a supervisor, Ai insists she be taken as a "friend" instead of a "customer," and Akari gives in. As they tour the city, Akari realises from Ai's reactions that it is a miracle to like something you had previously disliked. Akari is asked to deliver an old letter. With the help of Woody, a sylph (airborn deliveryman), she find its destination but discovers it is now under water. She and Alicia read the letter and learn that it is from a woman writing to her husband who was away working on the terraforming of Mars from before the oceans rose and the planet was renamed Aqua. While training in a strait with difficult currents, Akari and Aika witness the impressive rowing skills of a younger girl, Alice. She bluntly refuses their attempts at friendship, but is troubled by Akari's sincere smile, which is unlike those of other undines. The next day, Alice meets Akari and Akatsuki, an apprentice salamander (weather controller), and joins them first on Akari's gondola tour of Neo-Venezia, then on Akatsuki's tour of the floating weather station where he lives, becoming friends with Akari in the process. 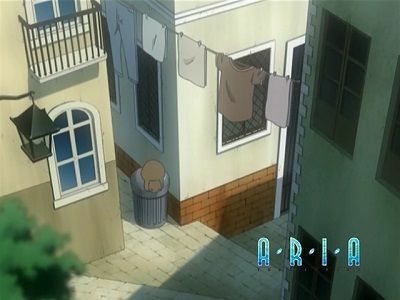 In the first half of a two-part episode, Akari and Alicia give the Aria Company building a spring cleaning. President Aria, the company president and mascot, is eager to help but gets in the way instead and, depressed, he runs away. In the second half, President Aria emulate his favourate cat superhero from a comic book, as he both fails and succeeds helping other cats and a young boy. 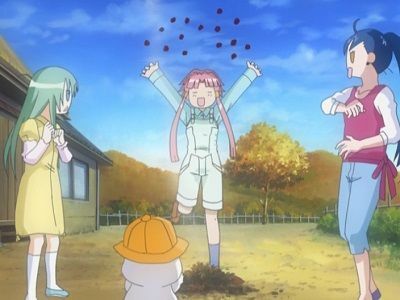 Akari, Aika, and Alice visit Akino, the legendary founder of Aria Company, in retirement in the countryside. Akino asks for the girls' help with domestic chores, and Aika believes they are tests that will make them great undines. That night, Akino reveals that the secret to becoming a good undine is to enjoy every moment. Akari decides to visit the first bridge built in Neo-Venezia. When she finds it, it is full of cats, including Cait Sith, the century-old king of the city's cats. 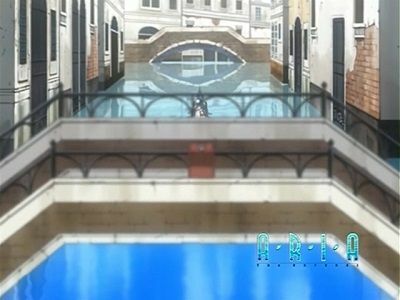 When Akari crosses the bridge, she time-travels back to before Neo-Venezia was built, where she witnesses the arrival of flowing water to the region, a result of the terraforming of Mars. Ai makes a surprise visit to Aria Company during the New Years break. While there, she meets Akari's various friends and inadvertantly embarrassed Akari by disclosing personal secrets and gossip that Akari had included in e-mails to Ai. 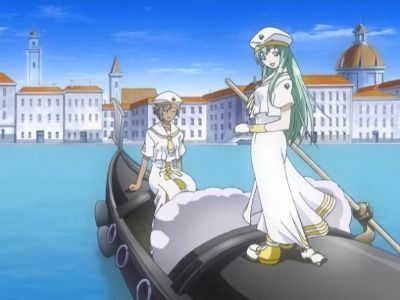 When President Aria randomly runs off, Akari and Ai give chase and are led to a glimpse of Neo-Venezia as it existed in the past. The two interpret this as formal welcome to Ai by the planet Aqua. When Alice leaves Orange Planet, Athena notices she doesn't stay with the other Pairs but goes off alone. After practice Akari and Aika visit Alice and Athena's dorm room, and when it becomes late without their noticing, Athena invites them to stay the night. That evening, Alice notices that Athena is more clumsy than usual and accuses her of being happy, and Athena says it's because Alice seems to be having fun with her friends. Alice receives an invitation to a party with other Pairs, but turns it down despite Akari's urging because she thinks they're jealous of her talent as a younger undine. Athena tells her that people are like mirrors, and that they reflect her fear of being rejected, which she sees as envy. After watching Maa go to great effort to climb onto a bed to bite President Aria's belly, Alice resolves to try to smile more and attend the party. In the first half of a two-part episode, on a summer day hot enough to see mirages on the ocean, Akari goes shopping in the afternoon. Through the heatwaves, she sees the street suddenly empty of people and thinks she has wandered into a dream. She follows President Aria into a cool cafe where only iced milk is served, because it's a refuge for the city's cats where humans usually cannot go. 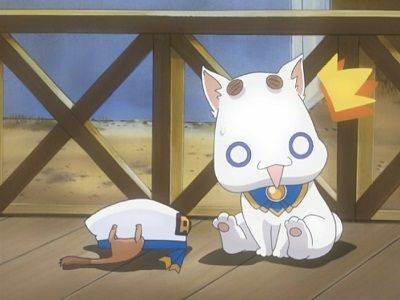 When Akari leaves, she sees Cait Sith tip his hat to her, and then the cafe turns into a boarded-up building and the people return. In the second half, Akari buys a nightshine windchime, a summer specialty of Aqua with a noctilucent clapper. For the month its glow lasts, she takes it everywhere with her, and at night holds tea parties with President Aria in her gondola, using it as their light. When it begins flickering out, Alicia and Akari follow Neo-Venezian custom and row out into bay to let the clapper drop into the water when it dies. When Akari's does so, it leaves behind a rare tear-shaped crystal, and Akari begins crying. As Akari eats lunch alone on a hot midsummer day, she is joined by Akira, then Akatsuki, and then Al. As Akatsuki bickers with Akira, Al claims he was always hotheaded like that, and tells a story about Akatsuki, Woody, and himself when they all were boys, shown in a flashback: one time in a playground, they don't let two new kids play with them, but when one jumps off a swing further than Akatsuki can, he challenges that kid to a slide race, during which Akatsuki crashes and concedes defeat. Back in the present, Alicia (who overhears the story) says it brings back memories, and reveals the two kids were Akira and herself. Akari says that it's nice, the way the lives of the other four circle around and meet again, inside the large circle that is Aqua, and that she feels left out because she's been in Neo-Venezia for only a short time. Akari reassures Akari that she's already inside their circle of friends, at the center. 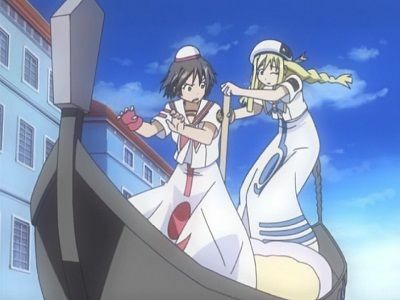 As the episode ends, Athena is shown rowing by, then several other characters meet in a series of chance encounters.